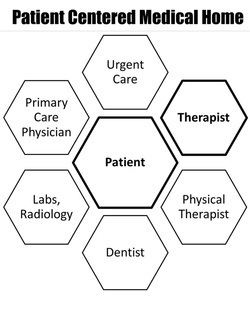 A patient centered medical home (PCMH) provides primary health care that is centered on the whole person. A PCMH is a place that can meet the large majority of each patient’s physical and mental health care needs, including prevention and wellness, acute care, and chronic care. You can find more information about PCMHs from the Agency for Healthcare Research and Quality. Located on the 2nd floor of Lindon View Plaza, we are in a prime location to serve you with the PCMH philosophy. The first floor of this building holds a Primary Care Physician's office (Premier Family Medical--Lindon Location), a Physical Therapist, Pediatric Dentist (Children's Corner), and Labs. We will be more than happy to communicate with these other offices to help you work on your whole person. If you attend another physician's office, we will coordinate care with your primary care physician and/or other healthcare providers.